Regular readers here will know, that I’m a big fan of the The Windows Club – a great bunch of guys who have written and released some terrific free applications including Right-Click Extender (an absolute favorite of mine), Ultimate Windows Tweaker and FixWin Utility – all of which I have reviewed here, and recommended, in the last year. 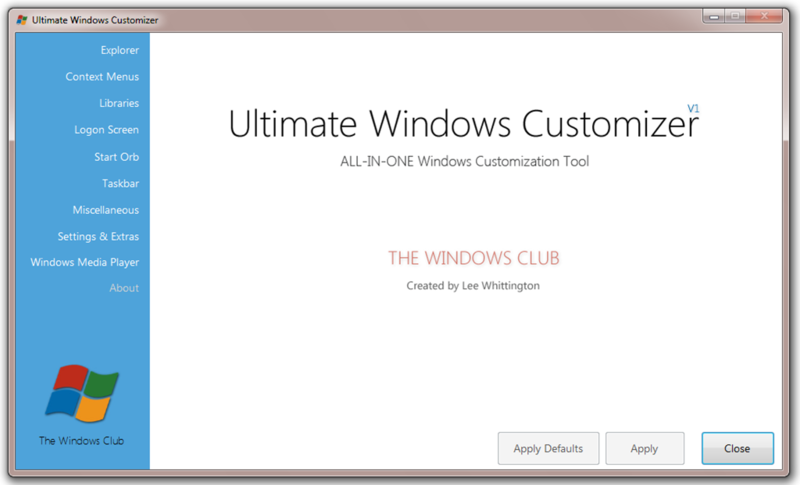 The Windows Club’s latest release, Ultimate Windows Customizer (brought to you by my good buddy TeX, who gave me a heads-up this week), provides a full range of customizations designed specifically for your Windows 7 installation. 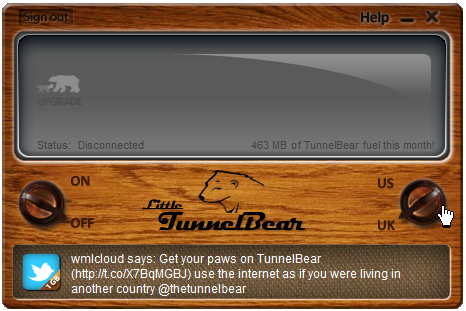 Following installation, the application opens to a simple “click here” interface. 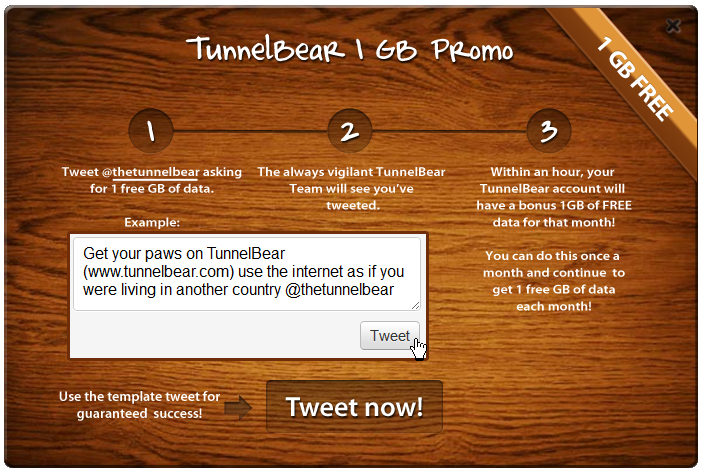 Clicking on any of the following screen shots will expand the graphic to its original. The following two screen captures illustrate just a few of the customizations which can easily be pulled off using Ultimate Windows Customizer. Very simple and easy to use. No manual Hacks. 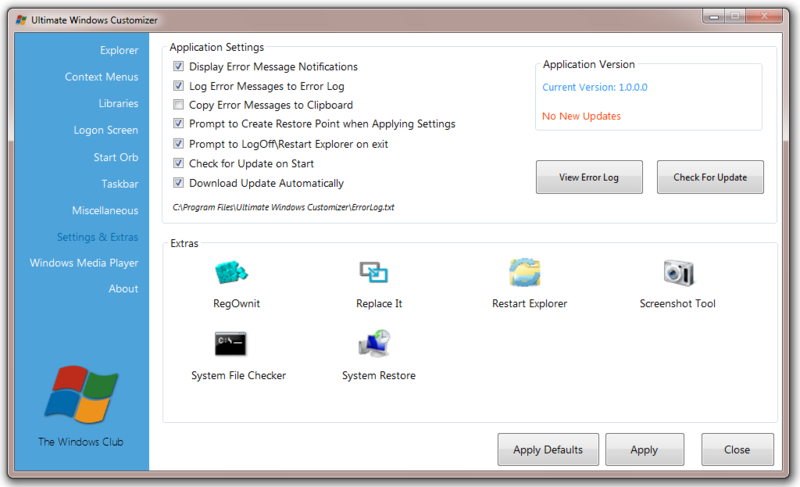 No need to manually edit the Windows Registry and Windows System files. 70+ major features with literally tons of sub-features. Error Log for easy display. 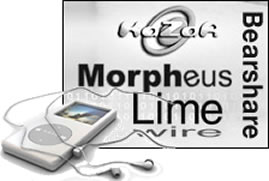 System Requirements: Windows 7 (32-bit and 64-bit). 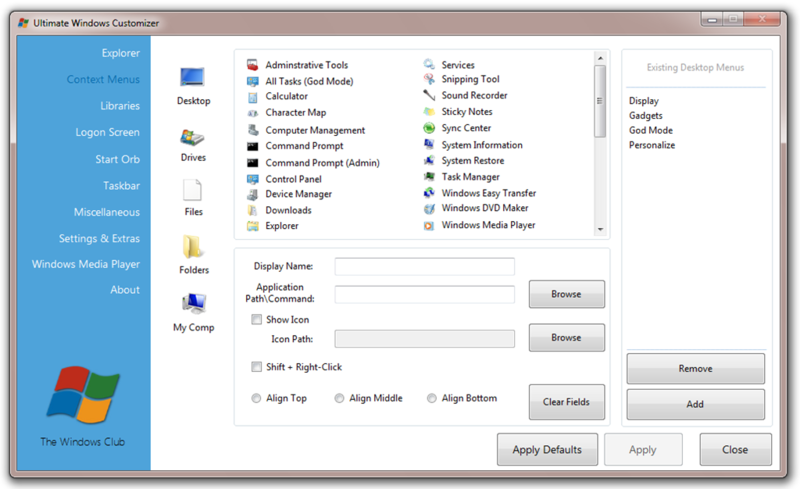 As with all Windows Club applications to date, Ultimate Windows Customizer is a terrific application. One which can add a little sparkle, and increased convenience, to any Win 7 installation. 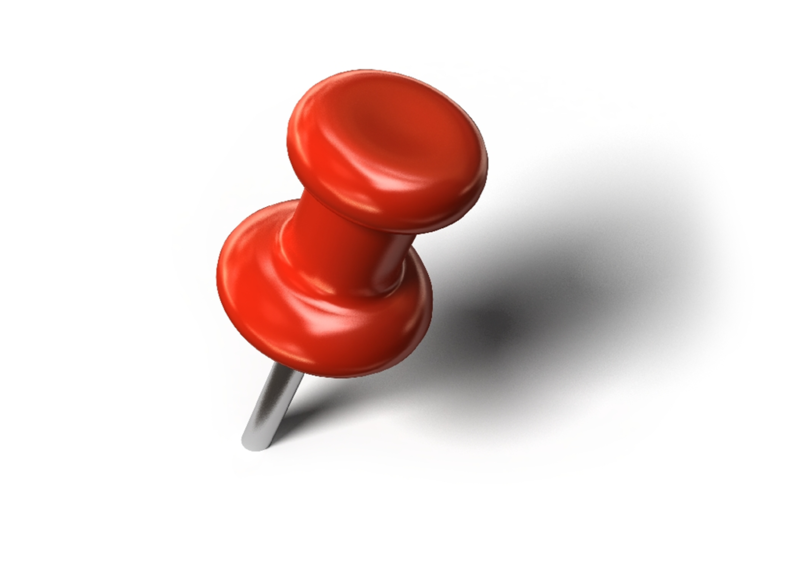 Pinning applications to the Windows 7 Taskbar is generally very easy. 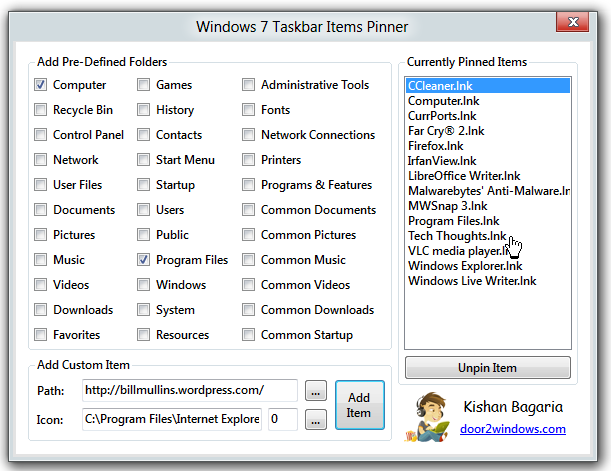 Unfortunately, Windows 7 Taskbar was not designed with the ability to pin files, folders, or web pages – but, a small freeware tool, Windows 7 Taskbar Items Pinner, enables you to overcome this limitation. Currently, I’m testing Windows 8, so in some respects, I’m working with a user interface which has been turned upside down. 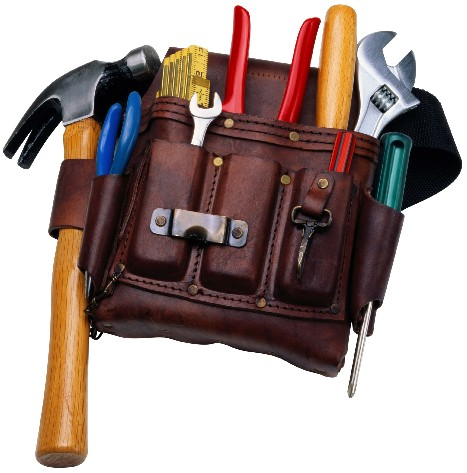 One casualty of Microsoft’s thinking is – a reversal on a quick and easy way to reach all installed programs. 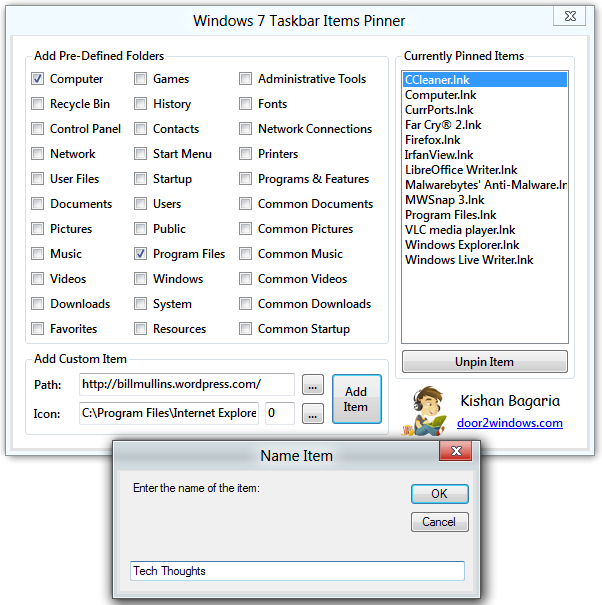 Using Windows 7 Taskbar Items Pinner, I’ve partially overcome this limitation by choosing to add two new links to the Taskbar – “Computer” and “Program Files”. 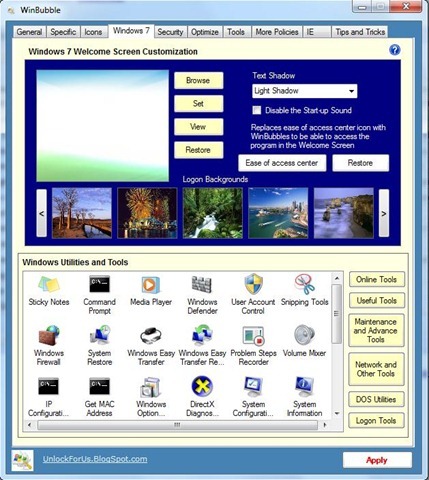 A partial screen shot showing “Program Files” on the Taskbar. 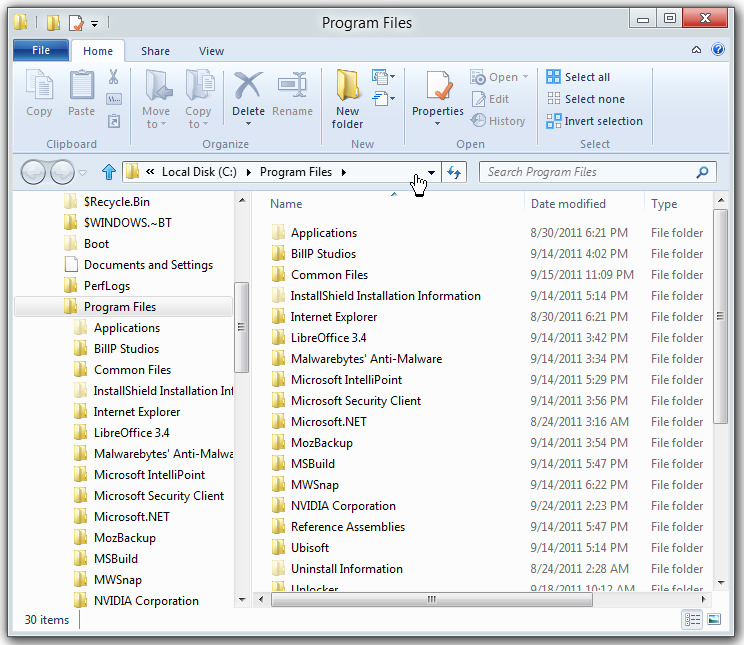 Activating the Program Files icon, launches the new Windows Explorer (notice the “Ribbon”) at C: Program Files. Since I work primarily in the “Desktop” – as opposed to Windows 8 Metro interface, I now have quick access to a listing of installed applications. 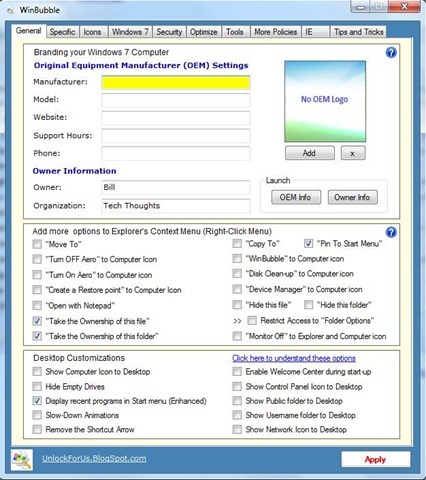 Custom items, including files and folders, or even a website can easily be added to the Taskbar – as the following series of screen shots (in which I have created a link to this website), indicate. 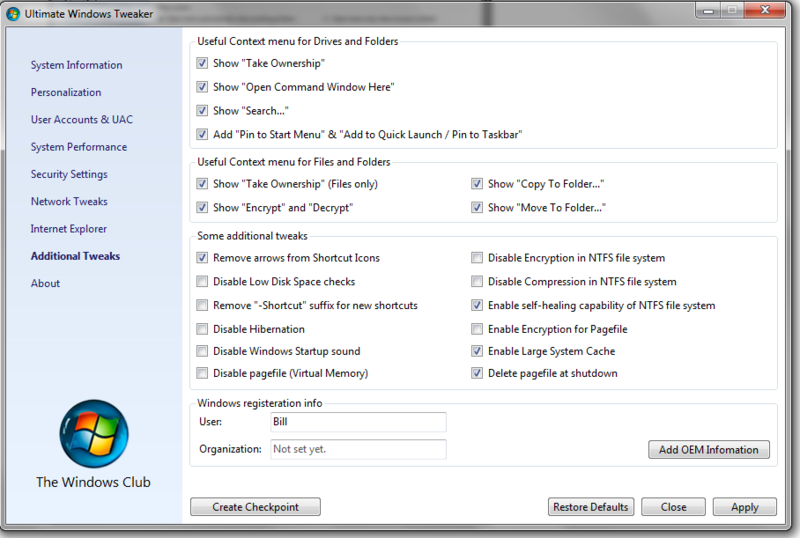 The new Taskbar shortcut to Tech Thoughts, is shown in the following screen capture. 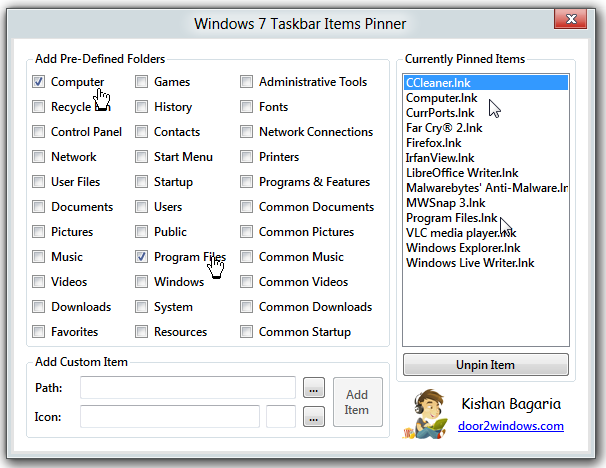 If adding files, folders and web links to the Taskbar in Windows 7 is an option you’d like to exercise, then checkout the developers page for additional information on how to use this freebie effectively. MachStudio Pro 2 – Price Cut From $4000 To Zero! A product price reduction is one thing, but reducing the product price from $4000 to zero, zilch, nada – well, that’s a whole other thing. In a rather surprising move, StudioGPU, the developers of MachStudio Pro 2 (which has an excellent reputation in the 3-D industry), has done just that. Sort of beats a Wal-Mart rollback hands down! If serious animation is your thing, and you have the hardware to support it – then rush on over to StudioGPU, and download their flagship product – MachStudio Pro 2. I should point out; this application is not a toy – this is the real thing; designed by artists for artists, and shaped by the actual demands of a production environment. Sample screen captures from video productions available at the developer’s site. Real-time rendering on your desktop — say good-bye to expensive render farms. Groundbreaking levels of interactivity giving the power back to the artist instead of the pipeline. Provides revolutionary workflow allowing manipulation of cameras, lighting, ambient occlusion, animation, and materials in real-time. Seamless interoperability with most leading CG software programs including Autodesk Maya and 3ds Max . Resolution independent, allowing renders at any resolution and format (e.g. 1080P, 720P, 16:9, 4:3, NTSC, PAL and even 2K and beyond). Render as final frame, or as passes for additional compositing work. Generate higher quality CGI results for less time and money. 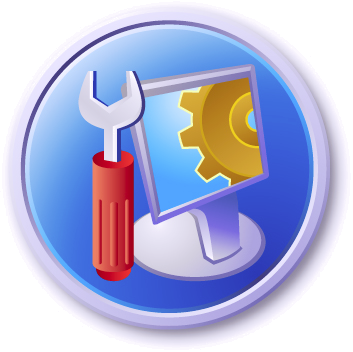 Windows 7 – 32 bit or 64 bit, Vista Business – 32 bit or 64 bit (SP1 or higher). If you’ve got a creative streak, and you have a drive to create imaginary worlds populated with imaginary characters, then this is a terrific opportunity to harness the power of your computer with the magic of MachStudio Pro 2. Checkout the video at the developer’s site. I’m not an artist, a movie producer or director, but I’ve been playing with animation creative software since the days of Autodesk’s ground breaking 3-D applications in the 1980s. You can be sure, I’ve already downloaded MachStudio Pro 2. Special thanks to Michael F., who brought this to my attention. 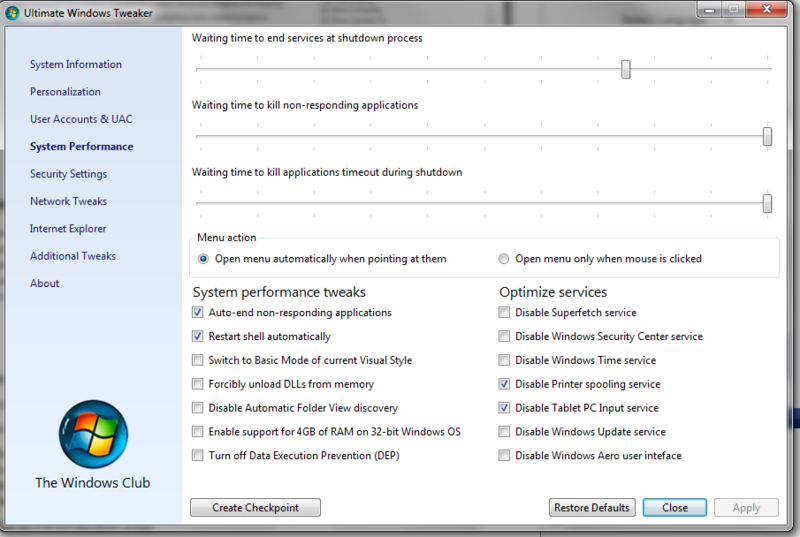 WinBubble gives you the power to tweak Vista and Windows 7, in all of these areas – system optimization, interface and desktop customization tweaks, security tweaks, including Internet Explorer tweaks, and it’s not finished yet. Believe it – there are even more tweaks to suit your fancy. 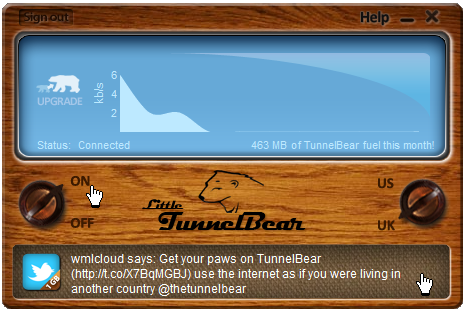 It seems interfaces are getting much easier to navigate these days, and WinBubble’s interface is no exception. It’s tabs and check boxes layout, should be easy to follow – even for less experienced users. 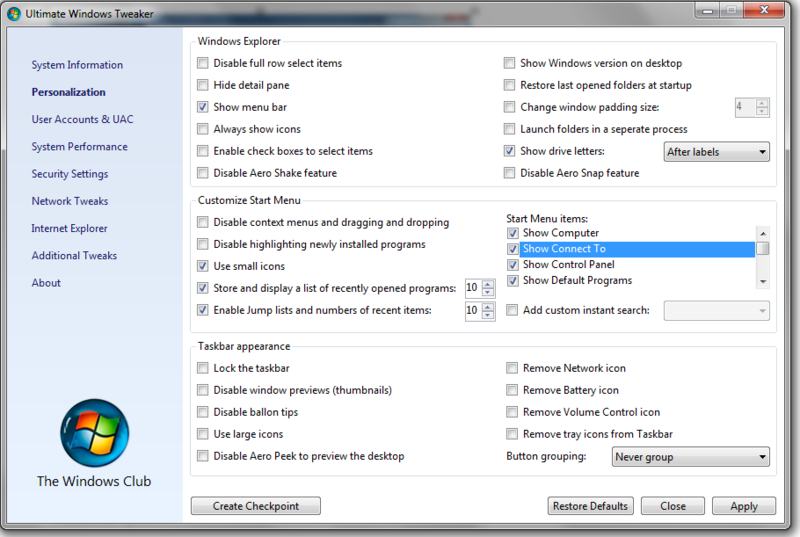 If you’re a Vista/Win 7 user, and an easy to use tweaker is what you’re looking for, then you’re going to love WinBubble. Note: The major benefit in using this type of tweaking application is the ease with which you can make changes to your system, without the drudgery of having to go through menu after menu, or manually editing the Registry. 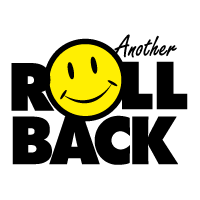 But, with any application that makes changes to your system, use caution, and be sure to have a verified backup, or current system restore point. System requirements: Windows 7, Windows Vista. 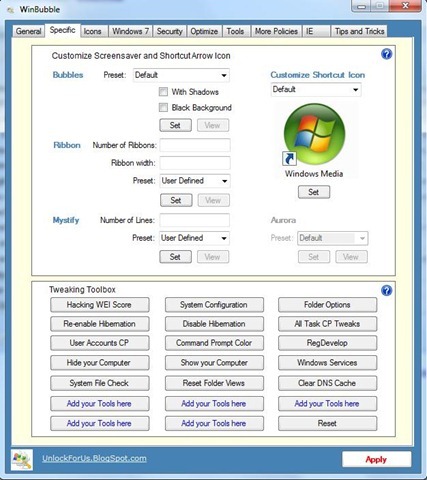 If you’re a Windows XP user then checkout Tweak UI which is designed for a Windows XP installation.